(San Diego, CA)- A dozen international masters skippers from America and Canada assembled on the green lawn between San Diego YC and the Malin Burnham Sailing Center to pick up their spinnakers and get their boat rotation sheets for the first day of racing on the fleet of matched, one-design J/105s. The sailors were looking forward to three gorgeous days of sailing on San Diego’s South Bay- an oasis of perfectly flat water ringed by a barrier island on one side and miles of US Navy dock yards on the other. The weather forecasts held true to form in classic S.D. fashion, “marine layer/ fog” in the mornings, clearing by midday, with sea breezes building in from the southwest and varying from 6 to 13 kts. In the end, Dave Perry from Pequot YC won the day with a crew “borrowed” from Dennis Case’s old J/105 WINGS championship team in San Diego. Here is how it all went down to determine the 2018 International Masters Champion. Light winds in the morning resulted in a 30-minute postponement, but the wind peaked at 12 knots by midday with temperatures in the low 80s. Cloudless skies and flat water made for ideal racing on the windward leeward course on beautiful south San Diego Bay. Dave Perry and Tad Lacey, both International Masters Regatta veterans, held their position in the front of the fleet and finished with a tie of 12 points. However, Perry’s win in Race Three was a crucial element to his standing, moving him into first place and putting Lacey in second. Holding the third place position was John Andron, winner of Race Two. “There was more current than everyone thought. The boats that went out of the current were always gaining from the left. We remembered that eventually and did well. We had no real mistakes today,” he continued. There’s an old adage in sailing: If you’re not over early every once in a while, you’re not pushing hard enough. Day Two was full of action, particularly at the start line. 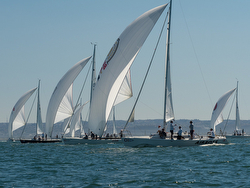 A handful of boats jumped the gun and were penalized with OCSs. At this point in the regatta, the Masters are looking to put points on their competitors by getting a good start and an early lead. But, this strategy took a toll on second place sailor, Tad Lacey. Conditions for Day Two were variable compared to Day One. The races started on a course axis of about 250 degrees. The wind steadily backed 50 degrees to the left throughout the day with numerous mark changes. The Race Committee adjusted the weather mark three times before the start of Series Race Eight. By the end of the day, the breeze faded from a peak of 9 knots to an average of about 6 knots for the final race. Dave Perry and his crew sailed competitive races, coming in first during Series Race Six and second in Series Race Eight. Perry continued to hold his first place standing at the end of Day Two with 26 points. Tad Lacey was in second with 38 points and Andy Roy was in third place with 44 points. Another standout in the results was a three-way tie for third between Andy Roy, Bill Menninger and Jon Andron, all finishing the day with 44 points. Roy won the tie breaker by taking second place in Series Race Seven. The breeze for Day Three started off similar to Days One and Two with light winds from the south. The morning’s foggy skies burnt off just in time for the regatta, but made for some unique photo opportunities on the way out to the course. The wind picked up and peaked at 9 knots midday, again making for ideal racing conditions on South Bay. Two new sailors to the International Masters Regatta also proved themselves with smart, intense sailing this weekend. Andy Roy, coming from Royal Canadian Yacht Club, started off Day One in fourth place and moved one step up the ladder each day, finishing in second place and earning his spot on the podium. 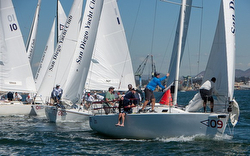 California Yacht Club’s Bill Peterson saw a similar climb finishing in third place by the end of the regatta. Both sailors were new to the J/105. Five-time U.S. Match Racing Champion Dave Perry started the regatta off strong and in the lead on Day One. Then, on Day Two, Perry never let the momentum die. 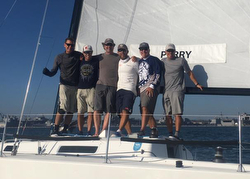 Numerous sailors jumped the gun and were forced to restart while Perry’s seasoned skillset and stacked San Diego crew got off the line clean and kept Perry at the top of the score sheet. When asked about the most important aspect of his win, Perry responded, “The day I put together my crew.” Perry had several local SDYC members return from last year and added previous friends he has sailed with in the past. “When they all said yes was the best day of the regatta,” he continued. Perry came to the San Diego Yacht Club this weekend from Connecticut where he sails at Pequot Yacht Club. He is known all around the country as an expert on the racing rules of sailing and as a Match Racing guru. Perry is a member of the Sailing World Hall of Fame and has dedicated much of his career volunteering with US Sailing, currently serving on its Board of Directors. He is a true ambassador for the sport of sailing. 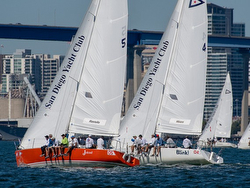 “I’m at the [San Diego Yacht] Club a lot, but I’m usually here to teach, not to race. Similar to match racing, there were so many situations just one-on-one in this regatta, like coming into the start and coming into the windward mark. If you teach something, you’re always thinking about it. I have a good visual image of the race course,” Perry explained. Race Chair Alli Bell worked behind the scenes all weekend to put together an outstanding weekend for the visiting Masters and thought the entire weekend was phenomenal. “It’s pretty cool to see a home town crew win. Dave came pretty close last year and had an unfortunate breakdown in one of the races, taking him out of the top three. I think this is some really good vindication for him and I’m really happy to see someone who’s a big contributor to the sport of sailing do so well this weekend.” Interview with Dave Perry Sailing video highlights of Race 11 Follow the J/105 Masters Regatta on Facebook here For more J/105 International Masters Regatta sailing information Add to Flipboard Magazine.